19 Commercial Real Estate & Properties in Chatswood are listed in 6 categories. We have 7 Retail ShopsSale , 5 Industrial Warehouses Sale , 4 OfficesSale , 2 Medical and Consulting PropertiesSale , 1 Other Commercial PropertiesSale and 1 ShowroomsSale . Medical Specialist Suite Auction Date TBA - Call B..
Shead Property is delighted to present this beautifully appointed medical specialist suite located with the very well know building, "The Archer" Chatswood. Being offered for sale by way of public auction is suite 112 which has 72sqm of internal area, balcony of 13sqm and one security car space. The existing quality fit out comprises of three (3) consultation rooms, reception, waiting area and storage. The entire first floor within "The Archer" has been dedicated and specially designed to accommodate medical specialists, the building has been completed to the highest standards. Features that have appealed to the medical professionals include wide, comfortable corridors, dedicated lift, high ceilings, abundant natural light and individual air conditioning.There is also a Zen Atrium Garden, positioned in the middle of the floor, providing an atmosphere of calmness and serenity. Specialists include a Pediatrician, Plastic Surgeon, Dentist, ENT, Cardiologist, Ophthalmologist and more. "The Archer" is perfectly positioned nearby the intersection of Victoria Avenue being a close, level walk to both Chatswood Chase and Westfield Shopping Centres. • Beautifully appointed Medical Specialist Suite • Quality Existing Fitout – Three (3) Consultation Rooms • Security Undercover Car Space • Attractive Lobby with Dedicated Lift Access • Fantastic Opportunity for an Owner Occupier Offered for Sale by Public Auction Date TBA For more information contact: Bill Geroulis 0413 100 200 Rick Sombroek 0412 280 181 Henry Farrell 0468 868 573 Disclaimer: All data is provided for information purposes only and while all care is taken in its presentation Shead Property does not guarantee or warrant the accuracy, completeness or currency of the information. Shead Property is pleased to present this rare opportunity located within a high profile Chatswood Victoria Avenue location. Being offered for sale by way of private treaty is Shop 39, 427 441 Victoria Avenue, Chatswood. The property is the largest shop within the well known Lemon Grove Centre. Located in the heart of Chatswood retail precinct, with direct access from Victoria Avenue, which has high pedestrian traffic. This property is truly a must see. Total area 325sqm (as per strata plan) Opposite to the Westfield Shopping Centre Direct access from high pedestrian traffic Victoria Avenue One (1) car space included Ideal for owner occupier or as an investment For further information please contact Bill Geroulis 0413 100 200 or Ivor Zhou 0430 248 867 Disclaimer: All data is provided for information purposes only and while all care is taken in its presentation Shead Property does not guarantee or warrant the accuracy, completeness or currency of the information. Under Contract - Rick Sombroek 0412 280 181 Under Contract - Rick Som..
Property highlights: Fully leased commercial office building with lift access Total lettable area: 1011.5m2 (approx.) Security car parking for 22 cars Heart of CBD location only 100m to Chatswood Bus & Railway Interchange Zoning: B3 Commercial Core (WLEP 2012) Proposed Zoning: Proposed B3 Commercial Core, FSR of 5:1 with unlimited maximum subject to site area and height restriction (STCA) Chatswood CBD Planning and Urban Design Strategy (Final Report, January 2018). Subject to Council Approval For more information contact: Rick Sombroek 0412 280 181 Bill Geroulis 0413 100 200 Ivor Zhou 0430 248 867 Disclaimer: All data is provided for information purposes only and while all care is taken in its presentation Shead Property does not guarantee or warrant the accuracy, completeness or currency of the information. Under Contract – Bill Geroulis 0413 100 200 Under Contract – Bill G..
Shead Property is delighted to present this medical investment located in the heart of retail CBD Chatswood. Being offered for sale by way of auction for the first time in over 20 years, the property will have a new 4 + 3 + 3 + 3 lease which will be by way of leaseback from the current owner. The leaseback will be to a dental surgery trading as Chatswood Dental Care currently owned and operated by Dr Tim Hart. Investment Highlights; • Sale & Leaseback Opportunity • New Lease 4 + 3 + 3 + 3 • Established Dental Surgery • Lettable Area 74 sqm • Three (3) Security Car Spaces – 63sqm • Net Rental $49,682 pa ex GST • Prime Victoria Avenue Mall Location For further information, please contact Bill Geroulis 0413 100 200, Rick Sombroek 0412 280 181 or Ivor (Shu) Zhou 0430 248 867. Disclaimer: All data is provided for information purposes only and while all care is taken in its presentation Shead Property does not guarantee or warrant the accuracy, completeness or currency of the information. Shead Property is delighted to present this solid retail investment located within a high profile North Shore location. Being offered for sale by way of private treaty is Shop 2, 809 811 Pacific Highway, Chatswood. This property is fully leased to a national food tenant, Subway, who have occupied the property since 2010. Located on the prominent corner of Pacific Highway & Victoria Avenue with exposure to approx 60,000 cars daily , this property is a must for any astute investor. Investment Highlights Leased to National Tenant Subway Solid Investment Prominent Corner Location 77sqm Retail Shop 30sqm Storage Three (3) Car Spaces 42sqm Massive Exposure to 60,000 cars daily Net Rental $51,048 pa ex GST For more information, please contact Bill Geroulis 0413 100 200, Anthony Parisi 0415 902 329 or Henry Farrell 0468 868 573 Source: Office of Roads and Maritime 2018 Disclaimer: All data is provided for information purposes only and while all care is taken in its presentation Shead Property does not guarantee or warrant the accuracy, completeness or currency of the information. Superb Retail Investment! Call Rick Sombroek – 04..
Arguably one of the best retail location in Chatswood, right next to Westfield Shopping Centre. Shead Property is pleased to offer this truly unique opportunity to purchase 394 Victoria Avenue, Chatswood for sale by public Auction. The Whole two storey shop has been trading as Mr Vitamins, a well known retailer of Discount Vitamins & Health Foods, for many years, and has a long 10 year lease to July 2026. Surrounded by well known names such as L'Occitane, CBA, Gloria Jeans, T2, Specsavers and Chemist Warehouse, this is an opportunity not to be missed! • Substantial Property – Prime Retail Location • Long Term Lease – 10 years (1st August 2016 to 31st July 2026) + 5 year + 5 year options • Land Area – 221 m2 (approx.) • Income $200,000 pa net (approx.) For more information contact: Rick Sombroek 0412 280 181 Bill Geroulis 0413 100 200 Ivor Zhou 0430 248 867 Disclaimer: All data is provided for information purposes only and while all care is taken in its presentation Shead Property does not guarantee or warrant the accuracy, completeness or currency of the information. 546 Pacific Highway is a freestanding 2 level commercial building of approximately 683m2 with a four car garage/storage at the rear. Under the current zoning and planning controls the property has potential for redevelopment (STCA). This site is perfect for owner occupiers, investors and developers. The property is currently leased to Real Flame. It's excellent location and close proximity to Chatswood shopping precinct provide the property with high exposure to passing motor and foot traffic. Strategically located in the middle of Chatswood's retail and residential precinct; Suite 10, 29 Bertram Street, Chatswood is the perfect entry for any investor or owner occupier into the Chatswood Strata Office market. This property provides the new owner with potential redevelopment upside due to its B4 Mixed use zoning. The strata lot consists of 32sqm with ceiling height of 2.8m (approx) and balcony access. Affordable entry into competitive Chatswood Strata market Strategically located in the centre of retail and residential hub Significant potential for redevelopment upside, B4 Mixed use zoning 32sqm office with balcony. Great natural light For Sale via Expressions of Interest Should you require any further information please call Anthony Parisi 0415 902 329 or Henry Farrell 0468 868 573 Disclaimer: All data is provided for information purposes only and while all care is taken in its presentation Shead Property does not guarantee or warrant the accuracy, completeness or currency of the information. Practical and office suite now for sale. Well presented with functional fit out and abundant natural light. Also included is kitchenette, bathroom facilities and 2 car spaces. This suite is priced to sell! Call Harry or Todd now to arrange an inspection. Located in the heart of the Chatswood industrial precinct Prime office/warehouse/workshop unit Carparking of approximately 12 spaces Just 20 metres from Smith Street entered off Eastern Valley Way Smith Street is walking distance from Chatswood CBD, Chatswood train station and regular buses along Smith Street and Eastern Valley Way. Neighbours include Bunnings, Woolworths, The Good Guys and Repco just to name a few. Great location just off Boundary Street and Penshurst Street, this small, well appointed unit is sure to please a tenant on the smaller scale of operations. Unit 9 offers a security undercover loading area. Office 54m2 Warehouse 91m2 Total 145m2 3 car spaces Rental: $39,500 + outgoings + GST Sale: $890,000 Ample on site visitors parking is available. Open plan professional office close to Chatswood Station and Westfield. Option to retain existing tenant or to occupy for your own business. Property features include: kitchenette with plumbing Ducted a/c throughout Resort style facilities Secure car space (LUG) Storage cage on title Close to all amenity Contact Sutton Anderson today for more information! Located only 80 meters from Victoria Avenue and Chatswood Chase Shopping Centre, this convenient medical/office suite is an excellent opportunity to own a strategic slice of Chatswood's future. Level 4 30 sqm medical/office suite Open plan layout, with air conditioning Great natural light Moments from Chatswood Chase, Public Parking & Chatswood Transport Interchange Refurbished strata building with lift & disabled access Ideal for medical use or professional services business Invest or Occupy to be offered with vacant possession Zoning B4 – Mixed Use Opportunity to own a strategic slice of Chatswood's future Price Guide $250,000 $300,000 ex GST For Sale by Expressions of Interest closing; Wednesday 13th December 2017 – 5:00 pm For further details please contact Rick Sombroek on 0412 280 181 or Bill Geroulis 0413 100 200. Disclaimer: All data is provided for information purposes only and while all care is taken in its presentation Shead Property does not guarantee or warrant the accuracy, completeness or currency of the information. Ground Floor Chatswood Retail Shop With Parking Call Rick Sombroek – 04..
Shead Property are very pleased to be appointed exclusive selling agents for Shop 4, 809 Pacific Highway, Chatswood. Located on the ground floor only 250m from Chatswood's rail and bus transportation hub, this is an ideal opportunity to establish your business or invest in the future of booming Chatswood. The shop holds a prominent frontage facing the Pacific Highway, the key arterial road linking Chatswood to North Sydney and the Sydney CBD. Ground floor shop Excellent exposure to Pacific Highway 55 sqm shop area + 10 sqm storage area Two (2) secure car spaces Kitchenette and toilet amenities Air conditioning Leased to 'Healing Art TCM Clinic Pty Ltd' on a 3 + 3 year lease. Ample onsite customer parking Outstanding private amenities including pool, gymnasium, spa & sauna, access to outdoor rooftop facilities Zoning: B3 Commerical Core under WLEP 2012 For further details please contact Rick Sombroek 0412 280 181 or Henry Farrell 0468 868 573 Disclaimer: All data is provided for information purposes only and while all care is taken in its presentation Shead Property does not guarantee or warrant the accuracy, completeness or currency of the information. Shead Property are very pleased to be appointed exclusive selling agents for this large freehold property in the heart of Chatswood's retail centre, adjoining Chatswood's iconic Concourse development. Prime retail Victoria Avenue location Extra wide frontage, over 15 meters Excellent passing trade Land size: 690 sqm approx Building size: 561 sqm approx Rear lane access via Archer Street Parking & Loading area at rear Spectacular fit out Leased to Star Capital Seafood Restaurant Redevelopment potential Zoned: B3 Commercial Core under Willoughby LEP 2012 For further details please contact Bill Geroulis 0413 100 200. Disclaimer: All data is provided for information purposes only and while all care is taken in its presentation Shead Property does not guarantee or warrant the accuracy, completeness or currency of the information. Under Contract Located only 300m from Chatswood's rail and bus transportation hub, 'The Chatswood' by Toga Group is one of the North's most recently completed quality commercial/residential developments, set to enhance Chatswood's rapidly growing reputation as a lifestyle destination for locals and visitors alike. This is an ideal opportunity to establish your business or invest in this exciting landmark development, situated in the bustling centre of Chatswood CBD. 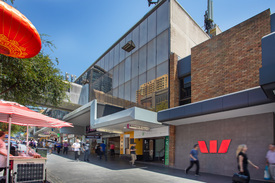 It has a prominent corner frontage on the ground floor and offers high exposure to Help and Anderson Streets and will become a natural extension of Chatswood's renowned 'Eat Street' dining precinct, ideal for restaurants, cafes, retail, gourmet food outlets and high end showrooms or corporate headquarters. Brand new ground floor shop Prominent corner position Shop Area – 70 sqm Offered with vacant possession Ideal for owner occupier or investor High visibility façade and pedestrian friendly street frontage Ample onsite customer parking Access to grease trap and exhaust Outstanding public and private amenities, all centered around a stunningly landscaped courtyard plaza Zoning: B4 Mixed Use under Willoughby LEP 2012 For further details please contact Bill Geroulis 0413 100 200 or Rick Sombroek 0412 280 181. Disclaimer: All data is provided for information purposes only and while all care is taken in its presentation Shead Property does not guarantee or warrant the accuracy, completeness or currency of the information.